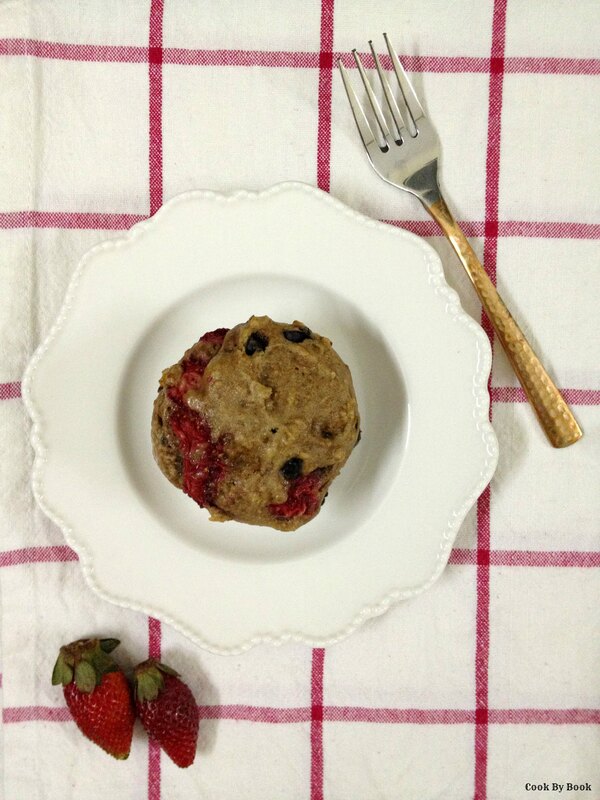 Skinny breakfast for your honey on Valentine’s day coming right up! 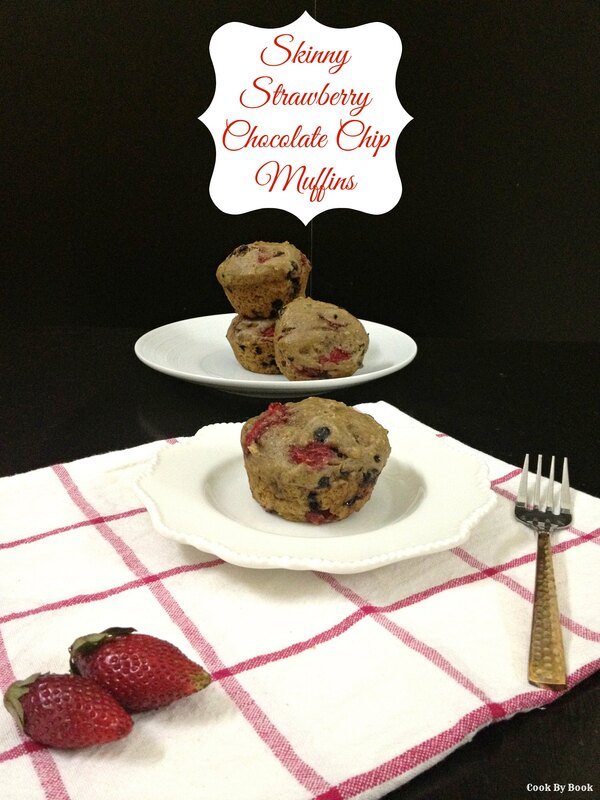 It has lots of strawberries and just the right amount of dark chocolate… Match made in heaven! Indulgent yet skinny. Celebratory yet healthy. Befitting, don’t you think? While posting these Skinny Muffins last week, I realized that I have few recipes posted here and wanted to set that right. Now that this sappy, lovey-dovey day is just round the corner, I had a perfect excuse to whip up this breakfast treat for the blog! There is nothing better than a warm muffin served with a hot mug of coffee. It gets better if served in bed! 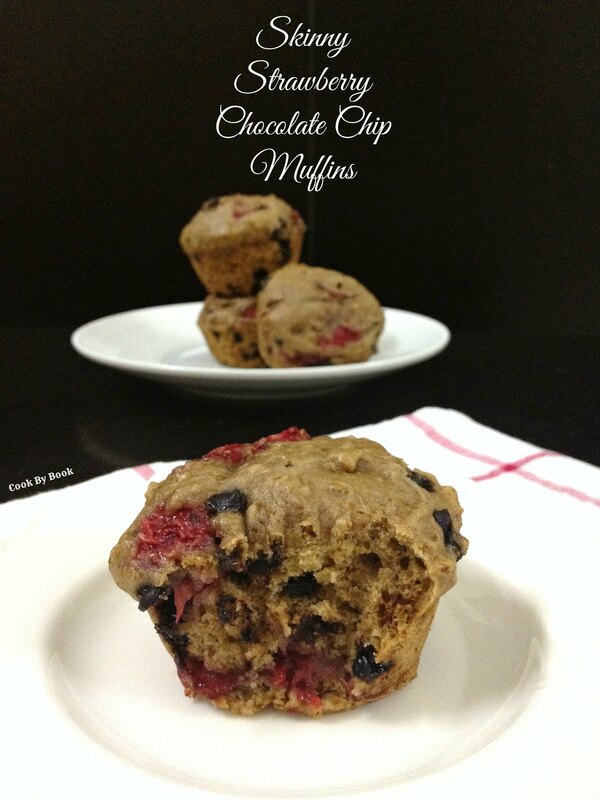 This muffin is a flavor bomb! 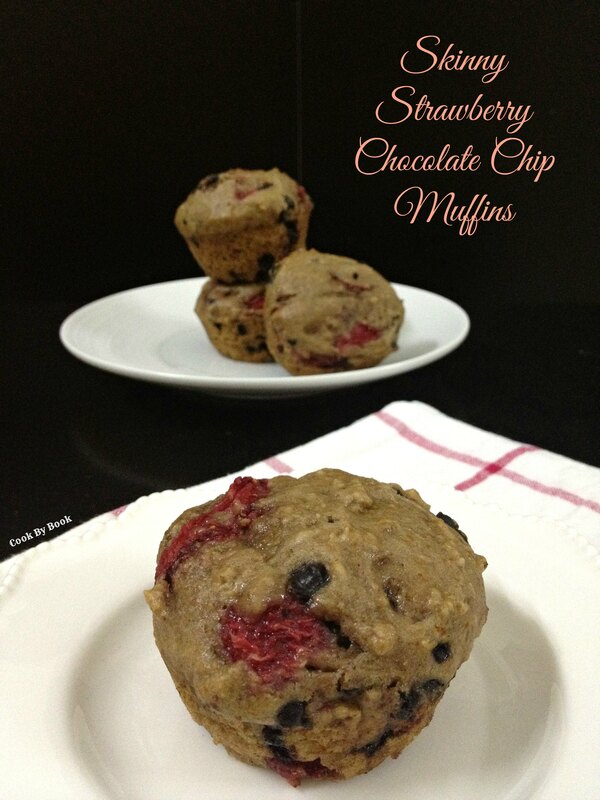 Bits of strawberries and chocolate chips in each bite is blissful. 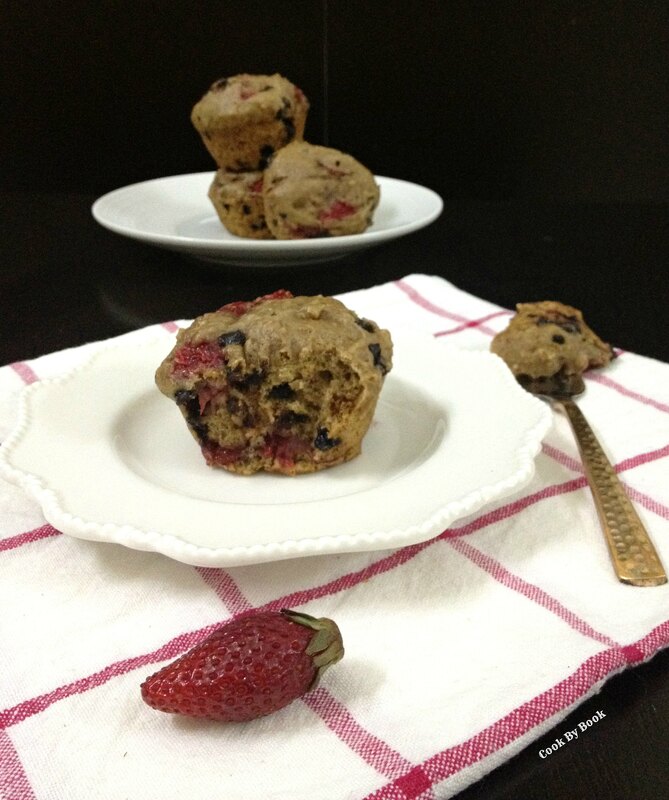 These muffins are soft, moist and surprisingly skinny. So flavorful and fluffy. No dry crumbs in sight here. They need very few and simple ingredients. One of the most magical ingredient of them is applesauce. Unsweetened of course. Applesauce will make sure that you don’t need to use any oil or butter! I wanted to keep the refined sugar to the minimum without making them taste cardboard-like. So I used combination of brown sugar and honey to sweeten them. I’m glad to report they were perfectly sweet! Preheat the oven at 180ºC/350ºF. Spray 6-count muffin pan with oil*. Set aside. In a medium mixing bowl, whisk together flours, baking soda and ground cinnamon. Set aside. In another medium bowl, whisk together applesauce, sugar, honey and vanilla extract. Add the wet ingredients to the dry until *just* combined. Fold in the strawberries and chocolate chips. Divide the batter evenly between 6 muffin cups. Bake for 16-20 minutes. Mine took exactly 18 minutes. Let them cool for about 5 minutes before releasing from pan. *Do not use muffin liners as muffins may stick to the liners. Note: Do not use whole wheat flour entirely as the muffins may not be turn out as soft. Thank you so much for leaving a comment! It sure means a lot..
Mac n cheese always reminds me of my growling up days when my bro n me use to bake it toghether…..today I Tried ur version of mac n cheese for my four yr old….it turned out just perfect n super healthy n ‘delicious’ as my son puts it!!! For a small batch, I use 2 red apples & 2 green apples. Core the apples & cut each apple into 8 slices(peeling is optional – I didn’t peel them – more fibre you see! ), microwave them in a steamer for 4 minutes or pressure-cook them for 10 minutes. Puree them in food-processor/blender until smooth. It tastes amazing even without sugar. Using assorted apples is the key to make it taste flavoursome. Store in a glass jar in the refrigerator or freeze it in zip-lock bag for future use. You may use this unsweetened sauce for baking, to make pancakes or simply spread it over a toast! Hope this helps Neha. Let me know if you have any questions! Elson, I crowned her first!.. :)) haha. but seriously, strawberries and dark chocolate – awesome combination. You know, you made it all healthy and skinny.. but I would eat this yummy little muffin with a huge scoop of whipped cream !! Keeper recipe Riddhi.